This book is just the most beautiful literary meditation on art and nature that I could imagine. Even in translation, there's a potency to the wonderfully evocative language that really resonates somewhere deep within. I definitely experienced visceral heart-wrenches at multiple passages. An inspiring literary fantasy about two gifted girls from the bestselling author of The Elegance of the Hedgehog, The Life of Elves sings of the human spirit and conveys a message of hope and faith. Muriel Barbery's new novel is the first of two books about Maria and Clara, unforgettable heroines of a world facing annihilation. Animated by a large cast of endearing characters, it is a timeless story about the forces of good and evil and a moving meditation on the power of nature, music, art, storytelling, and love. When the harmony between living beings turns to discord, the seasons will be loosed from their moorings and the natural world thrown into disarray; human beings—no longer capable of feeling either empathy or enchantment—will abandon themselves to hate, violence, and war. An epic battle between forces that wish to reestablish harmony in the world and those that wish to shatter it definitively is being waged on earth and in the mysterious land of mist, where the elves dwell. A ragtag army of rural peasants gathers in readiness for the fight—their weapons, an age-old kinship with the land and an affinity for magic. But humankind cannot hope to win this battle alone. Victory depends on help from the inhabitants of a world that is hidden from human sight. Hope rests with Maria and Clara, two girls whose prodigious artistic talents and deep connections with nature make communion with the numinous realm possible. Muriel Barbery is the author of the New York Times bestseller, The Elegance of the Hedgehog (Europa, 2008), and Gourmet Rhapsody (Europa, 2009). She has lived in Kyoto and Amsterdam and now lives in the French countryside. Alison Anderson’s translations for Europa Editions include novels by Sélim Nassib, Amélie Nothomb, and Eric-Emmanuel Schmitt. 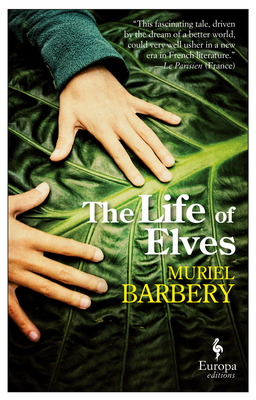 She is the translator of The Elegance of the Hedgehog (Europa, 2008) and The Life of Elves (Europa, 2016) by Muriel Barbery. "Ms. Barbery unleashes a complete magical menagerie." “...fans of both Barbery and fantasy from writers like Alice Hoffman and Sarah Addison Allen will be enchanted." "Muriel Barbery's lyrical prose is the perfect vehicle for this stirring novel devoted to the power of nature and art to lift humanity's gaze above the mundane...all magnified by Alison Anderson's masterful translation." "The bucolic narrative meanders into folk tale and myth as if getting lost in a lush garden." "This fascinating tale, driven by the dream of a better world, could very well usher in a new era in French literature." "The Life of Elves is at once realistic and dreamlike. Barbery's poetic language and her endearing characters will direct readers." "Muriel Barbery has composed a hymn-and a call-to the ancient complicity of hands, minds, and nature."